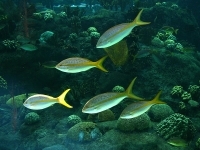 More than 5,000 aquatic creatures live at the three-storey Florida Aquarium, where it is possible to explore the underwater world in air-conditioned comfort. The Florida Aquarium is home to an impressive array of the animals found in the famous waterways of the state, including crocodiles and moray eels, as well as many of the favourites found in aquariums the world over. The aquarium offers behind-the-scenes tours, dive shows, audio tours, close-up animal encounters, and touch-tanks for an immersive the experience. There is a little waterpark and play area for young children needing some extra entertainment.